I have always admired the Danes and been proud to have a tiny bit of Danish blood in me because of the stories I have heard about their efforts to protect the Jews of their country during World War II. I didn't know, however, that Denmark did not start the war with resistance. In fact, when Germany first arrived, the king decided not to resist in order to reduce bloodshed and it seemed that most of the country was okay with going along with that. But a handful of teen boys were not. This book tells the story of the Churchill Club which is credited with helping start a full blown Danish rebellion against the Nazis. 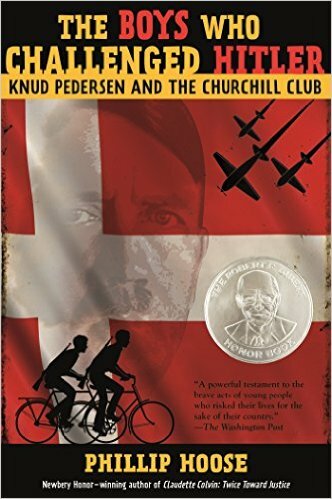 The author of the book met with Knud Pedersen who was one of the founding members of first the RAF club and then the Churchill Club, both groups of teens who were determined to fight back against the Germans in their country. The boys started with simple acts of vandalism such as painting their symbol on German buildings and cutting telephone wires. But before long they were stealing weapons and blowing up train cars full of airplane wings. The boys were eventually caught and imprisoned but their daring inspired other Danes to begin fighting back. At a time when many of us are struggling to think of ways to contribute to a resistance this is a great book to show that even smallish acts can lead to big results. The writing is clear with nice fact boxes adding other important details to help understand the time period. I don't care for a book that over-dramatizes a story but I felt that this one could've done with just a little more drama because the things that were happening were extraordinary. I also wish the publisher would change the format to make the book a bit larger with bigger text and pictures. It will definitely appeal to my students and is something I'm likely to put on a recommended reading list.